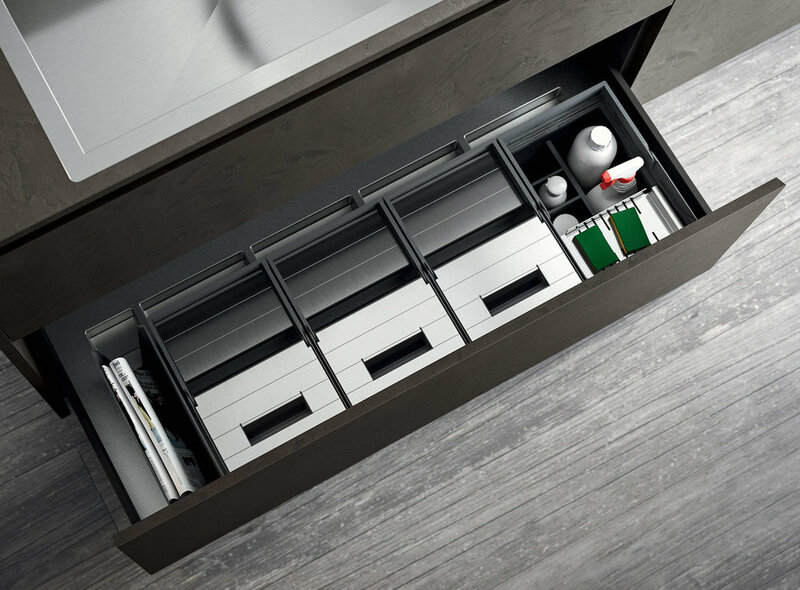 Combining the warmth and elegance of wood with highly contemporary minimalist forms, Easy Line offers a range of solid wood accessories for drawers and deep drawers, both modular and non-modular, to subdivide interior spaces and maximise storage potential. 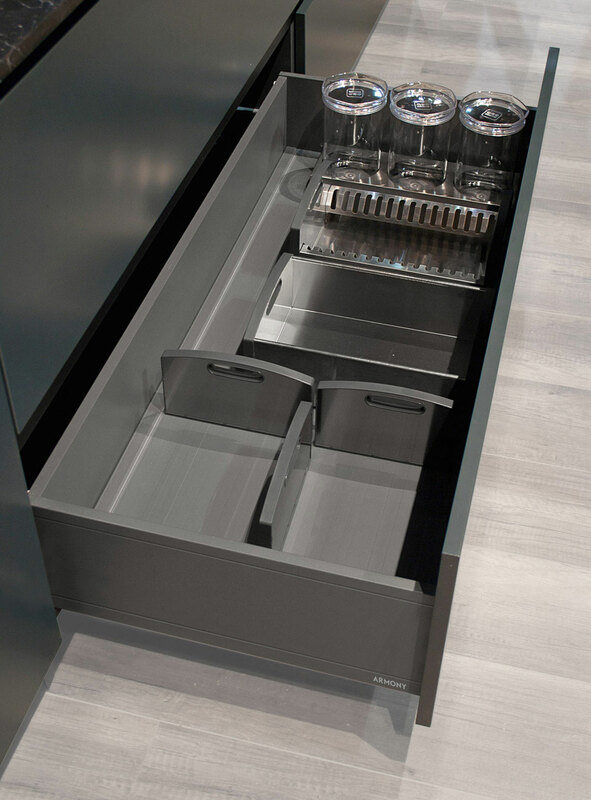 They are available in four different finishings, and the base can be chosen in the same finish or in stainless steel to create the perfect aesthetic design. The surfaces are a harmonious blend of style, prestige and functionality, where the clean look of stainless steel combines perfectly with the elegant warmth of wood. The solid wood dividers add a light and stylish touch to this accessory. The particular flared shape combined with the charm of solid wood makes these accessories for drawers and deep drawers an exclusive detail that lends elegance to the composition. 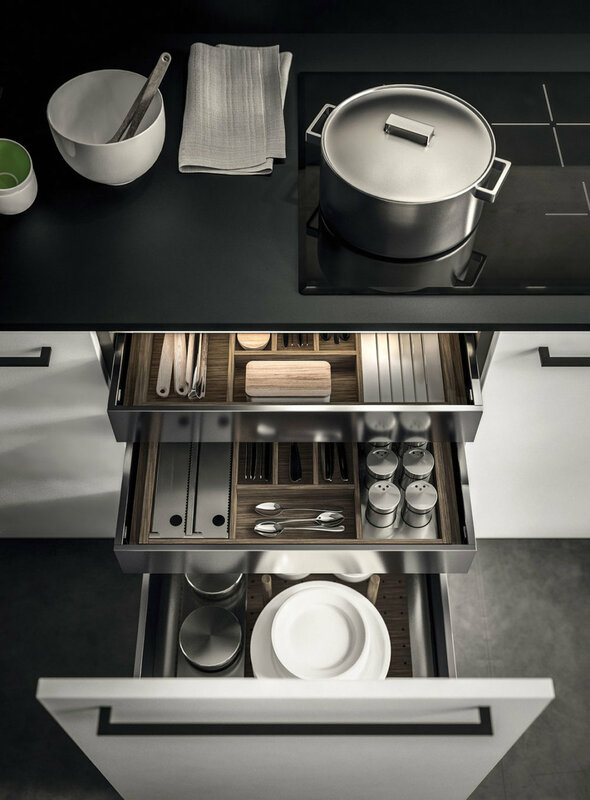 Available in two different finishes, the choice of available combinations is further enhanced by a whole range of stainless steel and polypropylene inserts. Functional and beautifully arranged spaces that make a strong statement. These accessories made exclusively from matt black painted solid ash can be freely arranged inside drawers and deep drawers. The individual elements available in this range can be used in countless combinations. These extremely functional interior dividers in magnetised plastic can be freely arranged in countless compositions to suit every individual need. This solution becomes even more practical when combined with the vast range of available accessories in white polypropylene or stainless steel. Armony offers a variety of solutions for dealing with kitchen waste. Among them, the Premiere range is notable for its beautiful design. The waste bins are available in two different colours to match the choice of interior baskets. As well as bins, the Premiere range includes detergent holders and magazine racks. The bases and lids are in stainless steel.